© 1998, 2013 James E. Lancaster, Ph.D. Photography by the Author except where noted. 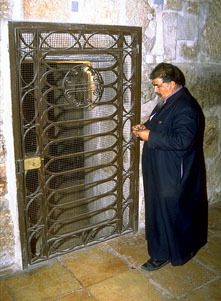 In December 1992 I spent two days in Jerusalem photographing various religious, historic and archaeological sites. Late on the first day I was in the Church of the Holy Sepulchre, sitting in the Chapel of St. Helena,1 when a cleric unlocked a steel door in the wall behind me. A tour group followed a guide through the door and the cleric sat down near me to wait for them to come out. I asked him what was behind the door but I could not understand his answer. So I asked him if I could go in and I think he nodded yes. Without hesitating, I followed the group through the door and into an ancient quarry. Then, in an adjacent area called the Chapel of St. Vartan, I saw the drawing of a ship on the side of an ancient building block. Below the drawing was the Latin inscription DOMINE IVIMUS (Lord, we went), possibly referring to Psalms 122:1. 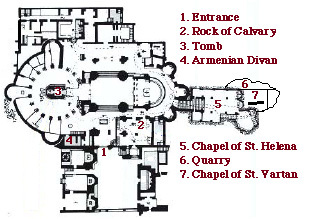 The quarry and chapel were excavated in 1970-71 under the direction of Archimandrite (now Bishop) Guregh Kapikian of the Armenian Orthodox Church. During the excavation parts of six ancient walls were found -- four dating to the Hadrianic period (2nd century AD) and two to the time of Emperor Constantine (4th century). 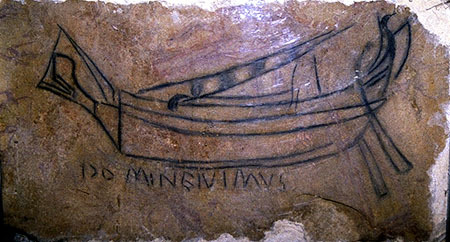 The ship drawing was discovered in November 1971 on the side of one of the Hadrianic walls. The drawing and inscription were possibly left by a pilgrim to the Holy Land around 330 AD when the original church was under construction. I had read about them in archaeological literature2 but had not expected to see them since the chapel isn't open to the public. I don't know how the tour group had arranged for access but I was in the right place at the right time and took advantage of it. have plans that pre-date the excavation of the quarry and the chapel in 1970-71. In May 1995 I was planning another visit to Jerusalem, this time including my wife. I contacted several individuals and organizations, mostly in Israel, regarding access to various archaeological sites. One question I asked was how to gain access to the Chapel of St. Vartan. I wanted my wife to see the ship drawing and inscription but I knew from my previous visit that they were behind locked doors and I did not know who had the keys. No one responding to my St. Vartan question seemed to have an answer except for someone at the Christian Information Center in Jerusalem who suggested I contact George Hintlian, an Armenian historian, since the chapel was controlled by the Armenian Orthodox Church. Unfortunately there was not time to correspond with Hintlian before we left for Jerusalem. We arrived in Israel for a two week visit in late June. On our first morning in Jerusalem we visited the Christian Information Center.3 They suggested that I go to the Armenian compound and talk to George Hintlian in person. So we walked the short distance to the compound, which is in the adjacent Armenian Quarter4 and includes St. James Cathedral, the headquarters of the Armenian Orthodox Church in Jerusalem. St. James is well worth a visit but is only open about an hour each day. I was told by an attendant at the entrance to the compound that Hintlian wasn't there but that I could find him at the Swedish Bible Study Center. The latter was next to the Christian Information Center from which we had just come. The information proved to be false. Hintlian wasn't there either and they didn't seem to know where we could find him. I felt like we weren't getting anywhere so we headed off on a walk into the Old City. After lunch we decided to make another try and headed once again for the Armenian compound. The same attendant was on duty and this time he allowed us inside the compound (normally off-limit to the public) and directed us to George Hintlian's home. It was on the far side of a large, somewhat spartan, but spotlessly clean courtyard. Hintlian wasn't there but I left him a note asking him to call me at St. Andrew's Church hospice where we were staying. Later that afternoon we made the first of several visits to the Church of the Holy Sepulchre.5 While there I noticed a man dressed in street clothes but carrying a pistol in a holster on his belt. Although a somewhat more common sight on the streets of the Old City, it was unusual to see an armed person inside a church. I assumed he was a security guard and asked him about the Chapel of St. Vartan. He suggested I contact Bishop Kapikian, whom he said I could find at the Armenian compound. So we went back to St. James a third time and encountered a new attendant at the entrance. After an explanation of what I wanted he phoned the bishop and let me talk to him. Bishop Kapikian told me that although he had directed the archaeological excavation of the Chapel of St. Vartan in the 1970s, he unfortunately no longer had any direct control over it. In his own words, he no longer had “the keys.” He told me to contact a Bishop Vaghash at the Church of the Holy Sepulchre. He said Bishop Vaghash was the new custodian of the chapel. However, he was not very optimistic that Bishop Vaghash would agree to let us in. George Hintlian called me that evening and was even more pessimistic. He said the chapel had been closed to the public and thought we would need the approval of the Armenian Orthodox Patriarchate in Jerusalem in order to see it. All this happened on Wednesday. We were busy the next day with other activities -- an Archaeological Seminars First Temple tour to the City of David6 in the morning and a tour of the Israel Museum archaeological wing in the afternoon -- and had no time to follow up on Bishop Kapikian's or George Hintlian's suggestions. Alas, with so much still to see, I had pretty much given up any hope of getting into the Chapel of St. Vartan. Friday morning we took a Zion Walking Tour to Mea Shearim.7 After lunch we went to St. James Cathedral to observe the afternoon service. While taking photographs I made a mental note of the interesting triangular shaped hoods worn by the Armenian clerics. From St. James we walked across the Old City to the Via Dolorosa and followed the Friday afternoon Franciscan procession from Antonia's Fortress8 to the Church of the Holy Sepulchre. We stayed in the church quite awhile and just as we were about to leave, I noticed a cleric standing in the rotunda and wearing one of the distinctive triangular hoods I had seen earlier at St. James. Recognizing him as Armenian I immediately thought of Bishop Vaghash. I asked the cleric if he knew where I could find the bishop. He didn't answer but simply pointed to a door at the top of some stairs on the south side of the rotunda. I went up the stairs and through the door and inside found a shop of sorts.9 The only people in the shop were a few visitors to the church and a man in an open-collared blue shirt and blue coat, selling candles and other religious items from behind a table. I didn't see anyone who looked like a bishop. I went back to the cleric in the triangular hood and asked him a second time. His answer implied that the man in the blue shirt and selling the religious items was in fact the bishop. I guess being a shopkeeper was one of his assignments! I went back in and when all the other visitors had left, asked him if he was Bishop Vaghash. He didn't say yes but asked me in somewhat broken English what I wanted. I told him I wanted to see the Chapel of St. Vartan. He told me that it was too late in the day (it was about 5:00 PM) and to come back the next day (Saturday) at 2:00 PM. As we left the church I was still wondering if I had really talked to Bishop Vaghash. We came back the next day, our fourth day in Jerusalem. But at 2:00 PM the same man was again busy selling candles and other trinkets, this time wearing only the blue shirt. When there was a break in the customers he took the opportunity to water some plants. This was followed by more customers. When I finally had a chance, I reminded him why I was there. But I still wasn't sure we would ever get into the chapel. Then suddenly at about 2:30 there were no more customers and no more plants to water. He put on his blue coat, closed the shop, and, without any word of explanation, escorted us down to the Chapel of St. Helena. Once there he unlocked the grated steel door into the adjacent quarry site, and turned on the lights. We spent about ten minutes in the quarry and in the Chapel of St. Vartan while he waited outside. looks for the key to open the iron gate into the ancient quarry. First Temple period, probably the 7th or 8th century BC. The Chapel of St. Vartan with the Ship Drawing in the lower center. at the rear dates to the 4th century and is a part of the original Constantinian church. are from the protective glass that now covers the drawing. When we came out Bishop Vagash turned out the lights, locked up the chapel, and walked back to his shop - all without saying a word. I gave him a small monetary contribution and he nodded in appreciation. We were elated. We had walked through an ancient Israelite quarry. We had seen the ship drawing and read the Latin inscription. We had witnessed first hand the almost 1700 year old signature of a pilgrim like ourselves. We had finally found the person with the keys. I hadn't realized how complicated a simple visit to an archaeological site could be. 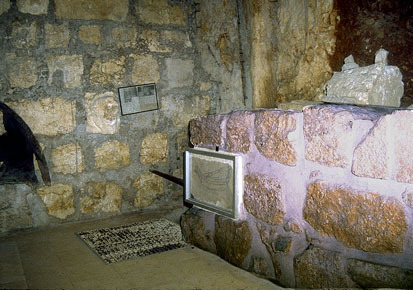 The Chapel of St. Helena is in the east end of the church (the opposite end from the tomb) at the bottom of a flight of stairs. I had read about the drawing and inscription in the first article by Magen Broshi and in Finegan's book. More recent descriptions appear in the books by Shanks and by Gibson and Taylor. The latter contains the most comprehensive description to date and the authors propose a 2nd century date for the ship drawing -- nearly two centuries earlier than the generally accepted 330 AD. The Franciscan-operated Christian Information Center is in the Old City of Jerusalem, just inside the Jaffa Gate and across from the Citadel. It's a good place to get information on religious sites in Jerusalem. The Old City is divided into four quarters: Armenian, Jewish, Muslim and Christian. When entering at the Jaffa gate, the Armenian Quarter is to the right (the southwest corner of the Old City) and the Christian Quarter to the left (northwest corner). The Church of the Holy Sepulchre is in the Christian Quarter. Archaeological Seminars is on Habab Street in the Jewish Quarter. They offer excellent First and Second Temple walking tours. Zion Tours offers a variety of excellent walking tours. They are located across from the Citadel and the police building near the Jaffa Gate. Antonia's Fortress stood at the northwest corner of Temple Mount in what is now the Muslim Quarter. Freeman-Grenville refers to this room as the "Armenian Divan." Magen Broshi, "Evidence of Earliest Christian Pilgrimage to the Holy Land Comes to Light in Holy Sepulchre Church", Biblical Archaeology Review, Dec. 1977. Reprinted in Archaeology and the Bible, Volume Two, Archaeology in the World of Herod, Jesus and Paul, Edited by Hershel Shanks and Dan Cole, Biblical Archaeology Society, Washington, DC, 1990, pages 267-269. Magen Broshi, "Excavations in the Holy Sepulchre in the Chapel of St. Vartan and the Armenian Martyrs." 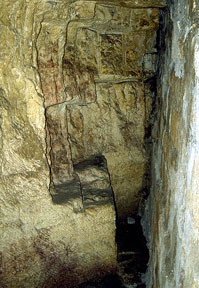 In Ancient Churches Revealed, Edited by Yoram Tsafrir, Israel Exploration Society, Jerusalem, 1993, pages 118-122. Jack Finegan, The Archaeology of the New Testament, Revised Edition, Princeton University Press, Princeton, NJ, 1992, pages 280-282. S. P. Freeman-Grenville, The Holy Land, A Pilgrim's Guide to Israel, Jordan and the Sinai, Continuum, New York, 1996, page 53. Shimon Gibson and Joan Taylor, Beneath the Church of the Holy Sepulchre, Jerusalem, Palestine Exploration Fund, London, 1994, pages 7-48. Hershel Shanks, Jerusalem, An Archaeological Biography, Random House, New York, 1995, pages 210-213.